Bumper crop of oregano this year? 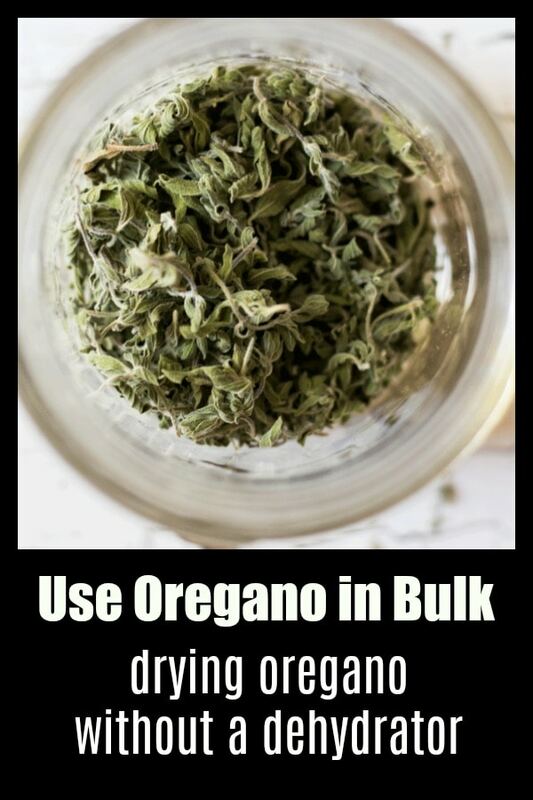 Use oregano in bulk with this quick and easy method that will allow you to dry LOTS of oregano for use all year round. Keep in a mason jar and crumble into your favorite recipe when needed. I have recently invested in a dehydrator (thanks Black Friday), but before that spiffy machine, I was drying all my herbs with this method. You just need a little bit of space and a little bit of patience. And it is totally worth the effort – oregano is just as good (if not better??) dried, than it is fresh. Sometimes I reach for my homemade dried oregano rather than going out and picking the fresh stuff, it’s just that darn tasty. How Much Effort is Required to Use Oregano This Way? Not much! Just pull, wash, and pat the leaves dry. Line them side by side on a clean baking tray, pop into a dry, well-ventilated area (not in direct sunlight), and leave to dry. You can always cover with a light cheese cloth in order to ensure those dust bunnies stay away, but I usually don’t bother. 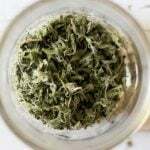 Turn the stems several times during the drying process to expose the leaves evenly to air and heat. If space is at a premium then you can hang those babies! Just gather the leafy stems into a “bouquet”, tie them together and hang to dry in a well-ventilated area. Once the leaves are dry and the stems are stiff (up to a week), you can remove the leaves for storage. The best way to do this is to pinch the stem at the bottom and pull up. The leaves should fall away easily. If they don’t, they aren’t dry enough yet and you should leave them to dry for a bit longer. Pop into a glass mason jar and keep in the spice drawer for about 6 months (you can keep them for a year, but the flavor is best within the first 6 months). That’s it! What’s your favorite way to use oregano in bulk? I just love to hear from you so be sure to pop back and leave a comment sharing your genius ideas with us all! Happy eating. To remove the leaves for storage pinch the stem at the bottom and pull up. The leaves should fall away easily. Pop into a glass mason jar and keep in the spice drawer for about 6 months (you can keep them for a year, but the flavor is best within the first 6 months). Such a brilliant idea, thanks for the helpful hints! It never ever even occurred to me that I could dry my own herbs. This is fantastic, thanks so much!